Our support for you and your hair begins with our products and ends wherever you need it to. The questions below may address some of your questions or concerns, but don’t hesitate to call our customer service line at 312-261-0872 Monday through Friday with anything you need clarified or changed. We’re here to make your order quick, easy, and perfect, so tell us how we can help. Q: Does Dr. Yates Hair Science accept orders from outside the U.S.? A: Currently, we only ship products to addresses in the United States. We do accept orders from anywhere around the world for delivery within the U.S.
A: Orders can be placed online anytime. You can also order by phone at 312-261-0872 or 1-866-810-6402. A: You can contact us at 312-261-0872 for an update on your order. A: We accept Visa, Discover, American Express, and MasterCard credit cards. A: You will receive an email confirmation once your order is placed if you provided a valid email address at checkout. The confirmation lets you know that Dr. Yates Hair Science has received your order. You should keep this email for your records. Q: Am I able to change or cancel my order once I’ve placed it? A: If you need to change or cancel an order once you’ve placed it, contact our customer service at 312-261-0872. Q: When will be order be shipped? A: Standard shipping and processing usually takes 5-7 business days from the time your order is placed. If you are looking for overnight or 2nd day delivery, it must be received by 1 p.m. on the day the product needs to ship out. Q: Can an order be shipped to a P.O. box? A: No, we are unable to ship to P.O. boxes. Q: How much extra does priority shipping cost? A: We do offer upgraded shipping options for our products. The additional cost will depend on the size of the order, the shipping destination, and the shipping method you’ve selected. Q: Is my credit card information secure when I order online? A: Keeping your order information safe and protected is our highest priority. We protect your online security by utilizing Secure Sockets Layer (SSL) technology. If you’re ordering from a shared computer, we suggest that you sign out of your account and close the browser after you’ve placed your order. You’re also able to place orders by calling us at 312-261-0872 or 1-866-810-6402. Q: Is there sales tax on the products I’m purchasing? A: Sales tax will be calculated according to the shipping address. Currently, all orders shipped to an Illinois address will be charged sales tax. Q: How does the auto-ship program work? A: Simply add the products you want to your cart and select “auto-ship program” during checkout. We’ll take an immediate 10% off on your order and add free shipping. You can choose how often you want your order repeated (30 days, 60 days or 90 days) and every order will receive the 10% discount and free shipping. Cancel at any time. Q: How can I cancel or modify my auto-ship orders? A: Call us at 312-261-0872, and we’ll help you with any changes or cancellations or 1-866-810-6402. 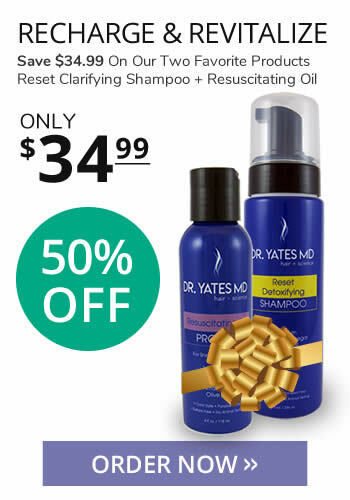 Q: What is the Dr. Yates Hair Science return policy? A: If you wish to return a product you’re not fully satisfied with, you can return the product for merchandise credit or a refund. Refunds will be given in the method of original payment. Included with your return should be your name, address, phone number, a list of products being returned and the reason for the return. Please note that it can take about 14 days for us to receive and process your return. A refund can be expected within 30 days of our receipt of the returned product. You’ll be notified by email once we have received and processed your return. If you have further questions about returning an order, feel free to contact us at 312-261-0872 or 1-866-810-6402, or info@dryateshairscience.com.